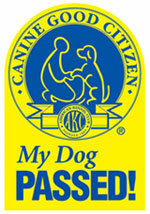 On August 24, 2012, six Michigan Dog Trainer students passed the American Kennel Club‘s Canine Good Citizen (CGC) evaluation at the Humane Society of Huron Valley (HSHV) in Ann Arbor, Michigan. The CGC is a ten step evaluation showing the dog is able to be under the handler’s control and show basic good manners such as knowing basic obedience commands, walking on a loose leash, meeting other dog teams appropriately, etc. Michael Burkey is a professional dog trainer and an AKC CGC evaluator. Currently, the CGC is a certificate program. Starting after January 1, 2013, CGC graduates are eligible to contact the CGC department and ask their certificate to be upgraded to a title accompanied by the appropriate fee. Starting in January, the CGC will become an official AKC title and handlers may place the initials “CGC” after the dog’s name. Additionally, several 0f the above students also earned their Novice Trick Dog (NTD) title through Kyra Sundance‘s Trick Dog tilting program, “Do More With Your Dog” for which Michael Burkey is an Associate Trick Dog Instructor for Sundance. To earn your dog’s CGC or NTD, view the Advanced Manners and Circus Dog classes held at HSHV. This entry was posted in CGC Stars, Trick Dogs, Uncategorized and tagged American Kennel Club, Ann Arbor, Canine Good Citizen, CGC, Circus Dog, dog, dog training, Humane Society of Huron Valley, Kyra Sundance, michael burkey, Michigan, Michigan Dog Trainer, Novice Trick Dog, Saline, Ypsilanti. Bookmark the permalink.